These lessons teach 3 to 9 year-olds that Bible stories are truth, not myth. Everything you need to present the lessons is provided, including reproducible materials and age-relevant, low-cost craft activities for each lesson. 96 pages, from TNT and CFP. 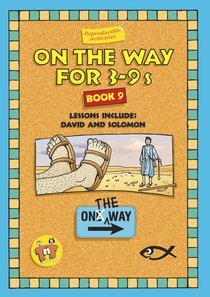 About "David & Solomon (On The Way Series)"
'We were nearly there when some figures blocked our way. I went cold all over. This was no chance encounter. They had planned this and waited for us. This was it. ''Move out of the way Blackie' the skinhead said. 'We got business with your friend.' Star Smith has enough problems in life trying to keep her wacky family a secret. Then a black girl arrives on the scene.... With the racist attitudes of kids in her area Star knows that if she befriends Ebony she could lose more than her reputation. Author of Alternative Sunday School Material 'On the Way' and the Youth Bible Studies Junction. TnT Minstries is currently headed up by Rory and Kim Bell having previously been run by Trevor and Thalia Blundell. Thalia and Trevor BlundellFirst Class is designed to help parents and teachers simply and clearly explainfundamental Christian truths to 2 to 3 year-olds. The 39 lessons includestories, activities, games, reproducible material and craft ideas. They can betaught at home, in a playgroup or in creche. 68 pages, from TNT and CFP. Challenging and intellectually stimulating, this instalment of the On the Way curriculum is especially designed for the 11-14 age group. There's less focus on craft and more on group discussion of hard-hitting issues. An excellent resource to help young people think for themselves in a Biblical way. Joseph; People in Prayer; The Saviour of the World (Christmas) Is God Fair? (Predestination); Learning from a Sermon; The Sermon on the Mount. Psalms (Easter) Paul's latter ministry; Colossians; Choose Life (Hell/Judgment); The Kings. Do you want to encourage children to read the Bible? Do you want them to realise that the Bible is God's guide for them, relevant, exciting, dynamic? TnT Ministries have developed 'On The Way' to meet your needs, the needs of your church and most importantly, the needs of the children you teach. 1. REPRODUCIBLE: The activities are photocopiable so one book is all you need per teacher. 2. MULTI-AGE: Each lesson has activities specially designed for three to five year olds, five to seven year olds, seven to nine and nine to eleven year olds so they can learn and thrive together. 3. COMPREHENSIVE: A three-year syllabus covers all the major doctrines of the Christian faith. 4. ENJOYABLE: Children love it and learn from it - so you will love teaching it too. 5. BIBLICAL: The children and the teachers learn together as everyone gets into the Bible. 6. TEACHER FRIENDLY: Lesson plans and preparation tips to make this series one you will recommend to others. It is designed by teachers who teach teachers. 7. TRUSTWORTHY: Edited by David Jackman of the Proclamation Trust this material has been tested in a variety of different denominational settings. It's worthwhile and it works. It doesn't matter if you are in a church, community hall or sports complex, 'On The Way' is flexible enough to suit a wide variety of situations. It doesn't matter how many children you have. You can have six or twenty six. You just photocopy the activity pages - there are no extra magazines to buy. It doesn't matter if your children come from a churched or un-churched background. The 'On The Way' series teaches God's Word simply and effectively. Churches around the world from America to France, Spain to Korea, Hong Kong to Australia have discovered the strength of this Sunday School syllabus. It is biblical, undated, multi-age, chronological and informative. Leaders and students are learning together the world over with the 'On The Way' series - a unique and excellent curriculum. Beginning With The Bible consists of three books for 2-3 year olds designed to introduce young children to basic concepts about God and his world. The series includes First Class, Beginning With The Bible - Old Testament and Beginning With The Bible - New Testament. First Class contains 34 lessons, during the course of which the child is taught about the God who made everything, even them, and who loves them and knows all about them. A further 3 lessons for use at Christmas teach the child the basic facts of the Christmas story. First Class can be used anywhere where there are 2-3 year old children - a creche, a playgroup or at home - and is good preparation for children prior to their entering a church Sunday School. It can be taught by parents or anyone else who has the care of young children and no special teacher training is required. Beginning With The Bible, A Class Above, is a sequel to First Class and is designed to teach young children the main Bible stories. It consists of two books, one covering stories from the Old Testament and one from the New. The Old Testament book contains 28 lessons, covering creation to Jonah. The New Testament book contains 29 lessons. - Publisher.